How much is Joe Moglia Worth? 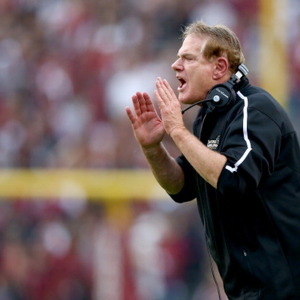 Joe Moglia net worth: Joe Moglia is an American football coach and entrepreneur who has a net worth of $24 Million. Joe Moglia was born on April 1, 1949 in Manhattan, New York. He currently coaches the Coastal Carolina Chanticleers in the Big South Conference, and in the business world also serves as the current Chairman and past CEO of financial company TD Ameritrade, the largest online discount brokerage firm in the world. Moglia got his start in business back in his college days, earned his bachelor's degree in economics from Fordham University, as well as a master's degree in secondary education from the University of Delaware. Then, sports beckoned, and he began his coaching career in 1968 as an assistant at Fordham Prep. From 1971-1974 he was an assistant at Archmere Academy, and from 1975-1978 at Penncrest High School. In 1978, Moglia moved to defensive coordinator at Lafayette, staying there until 1980. His final coaching job during his first football stint was at Dartmouth, where he served as defensive coordinator from 1981-83. After the 1983 season, Moglia started his second career in the financial centers of Wall Street, deciding to join a training class at Merrill Lynch so his career in the business world could really start in earnest. He spent 17 years there, serving as a member of multiple executive committees over the course of his career. Then in 2001, he was named the CEO of TD Ameritrade, going on to increas the company's client assets from $24 billion to more than $300 billion. The company's market capitalization was also reported to have increased from $700 million to $12 billion. In 2008, Moglia stepped down and took a volunteer job with Nebraska in 2009, eventually moving on to the Omaha Nighthawks in 2011. In 2012, he became head coach of the Coastal Carolina Chanticleers, and led the team to the 2012 Big South Conference title in his first season.